Hiked or raced down the alpine slide all day and still up for more? Head out to the pool for an evening swim. The "Grand" in the name makes perfect sense once you see the front drive. Grab seats fireside and stay until dinner duty calls. Maybe it's the mountain air, but those family favorites have a way of hitting the spot. When you're ready to hit the slopes, it's an easy 2 minute shuttle ride to the gondola. Relax and unwind at The Grand Spa. Enjoy a massage, facial or body treatment. The resort's outdoor covered hot tub is the perfect place to relax after a long day of skiing. Grab backpacks, water bottles, binoculars and cameras, and hit Spring Creek Trail, a 9 minute drive away. Rollingstone Ranch Golf Course is a 5 minute drive – just toss your clubs in the car and go. When you arrive at the Steamboat Grand you’ll enter a lavish lobby that has mastered the rustic/upscale combo, grand piano and all. Wood-paneled walls and luxe leather couches surrounding large fireplaces give a nod to the old mountain lodges of the American West. But this destination is by no means old-fashioned – the Grand has all the amenities of a high end resort, under the guise of a quaint mountainside lodge. Prepare for a big day on the slopes by sitting down to a hearty home-cooked breakfast in your fully equipped kitchen. Help yourself to seconds on pancakes, the mountain’s not going anywhere. Gondola Square is just across the street so there’s no need to catch a shuttle. Just a few steps and your crew will be shuffling through the lift line at the base. And you won’t have to schlep an assortment of poles, skis, boards and boots, (funny how the little ones just run off ahead, assuming you’ve got it all), because the Grand provides complimentary Ski Valet, which stores all your gear at Gondola Square for you. So each day you can waltz over to the lifts unencumbered and in your comfy street shoes, and gear up at the base of the mountain. Upon returning to the Grand, recoup and refresh in one of the huge hot tubs while kiddos play Marco Polo in the heated outdoor pool. After a good soak, be sure to head over to the fitness center for a steam in the aromatic eucalyptus-infused sauna. If you went a little too hard on the slopes, peruse the Grand Spa’s extensive massage menu. Back at the suite, if you don’t feel like cooking after an adventure-filled day, call up room service and eat around the fireplace while swapping stories from the slopes. But be sure to save a night for the award-winning onsite restaurant, The Cabin. Studios and one- to three-bedroom residences are clean and homey, spacious yet cozy. The kitchens feature modern appliances, hardwood cabinets and granite countertops – perfect for preparing your signature dish or whipping up après ski snacks. No matter which suite you’re in, each one has a stunning view of either the mountain to the east or Yampa Valley to the west. Sizeable living rooms with gas fireplaces make a great space for your crew to hang out and chill. 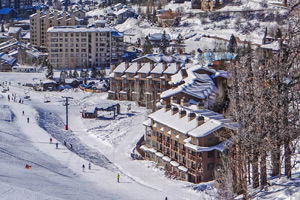 Take advantage of the complimentary shuttle to check out downtown Steamboat. Brunch at the Creekside Cafe, soak at the Old Town Hot Springs (which also has two waterslides), or go tubing at Howelsen Hill – they’re all on Lincoln Avenue. But there’s also plenty close to home. Grab some Szechuan at Chelsea’s White Dragon, or express yourself with a “paint and sip” session at Art Strokes. Got the midnight munchies? The Double Diamond bar serves tapas ‘til 2 am. The best part is: they’re all mere steps from the Grand’s lobby.